Hey kids! If you play your cards rights you might one day be the owner of your own cafe, working tirelessly day in and day out to please demanding customers that can't even go to the bathroom on their own. Sound dreamy? Perhaps Hello Kitty Cafe can help change your mind. 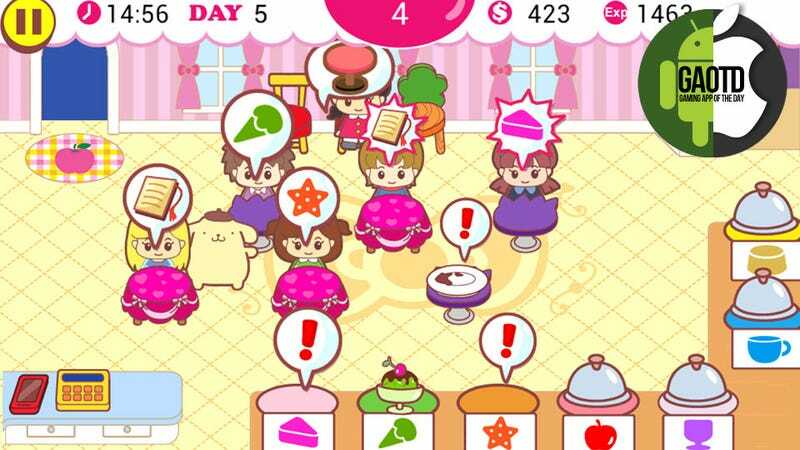 A free app from Sanrio Digital available now for iOS and Android devices, Hello Kitty Cafe is a pinker take on games like Diner Dash — games I can't wrap my head around. Having worked several food service positions in my long and painful life, and it was never the sort of thing I'd considered doing for fun. Of course Hello Kitty Cafe simplifies the process, removing the less enjoyable bits (smelling like food, talking to customers, muscle aches) to focus on the joy of fervently touching a screen, desperately trying to command your puppy character to grow an extra arm. The game begins with a single cafe worker — Purin. Customers come in. You seat them. You take their orders. You slide food to their tables. More customers come in. You take their orders. The first customers are at the register, trying to pay. More customers come in. You make food. The thought bubbles above the customers' heads turn angry red as you attempt to juggle them all. The guy at the register leaves without paying. The tables are filled with dirty dishes. There are people waiting. Now they're leaving. If this were a real restaurant you could take a smoke break, complain about customers to your coworkers or spit in some food to relieve stress. Here you just grin and bear it. Or dog-thing it. You can kitty it as well, but getting any of the more famous Hello Kitty characters to help you costs point that much be earned through offers or bought with cash. Pekkle can be bought with in-game currency, but no one likes Pekkle. Instead, use that cash to add more tables, upgrade the workers you do have, and decorate your cafe to keep it relevant to the local food critics (no critics actually appear in the game — who reviews an apple?). Every day you work. Every day it gets harder. On the plus side, you never have to call on Gordon Ramsey to come help you revitalize your dying business — the citizens of Sanrio have an endless appetite. It's repetitive, derivative, and it reminds me of days I'd rather forget, but the biggest problem with Hello Kitty Cafe? I keep playing it. I hated it so much, and then I hired the stupid duck, and now I am looking through the list of special offers that grant me Hello Kitty Points so I don't have to spend $20 unlocking all the characters. It's mindless and addictive, just like Kitty White.